Our main goal in Telsome is to offer the highest quality service to enterprises. To do so we ensure you have the highest quality on every phone call and the maximum stablity. VoIP telephony must be an ally to your enterprises success. When you use our hosted PBX you are joining a team of experts in communications willing to help you, advise you and set up your telephone system according to your goals. In Telsome we are all qualified VoIP technicians willing to help you. If you have a problem you can call us, open a ticket or send us an email and we will solve it in record time. 2. Do you need phones? Save up to 70% in monthly rates. Great national and international calling rates. No distinction between provincial and inter-provincial phone calls. Automatically forward phone calls to the right agent. Handle as many simultaneous phone calls as you need. Call queues will keep phone calls until agents are available. MultiSIP accounts to be able to answer phone calls from smartphones. No PBX hardware to replace over the years. Save time on every phone call with the auto attendant service. The Hosted PBX offers options to callers and forward the phone call to the right agent based on the selection of the user. The call queue collect phone calls and distributes them among the agents connected to the queue. When all agents are busy the call queue keeps the phone call with music on hold until an agent gets free. On that moment the call is forwarded to the free agent. You can add remote agents to the call queue, including fixed and mobile phone numbers. Don't lose phone calls when you are out of your office thanks to MultiSIP accounts. Users can use their phone extension at the same time on their VoIP phone, smartphone and even laptop or tablet and use it from anywhere to answer phone calls. When someone calls your enterprise and no one is available the voicemail will record the message and send you an email with the voice message attached. You can listen to voice mail messages from anywhere with email access. Increase comercial phone calls from users on your web using our Click to Call button. Web users will be able to ask our system to call them. Increase security on your conversations with encrypted phone calls. Perfect for an extra security on phone calls with confidential information. Check on detail incoming and outgoing phone calls done with your Telsome Hosted PBX. You can search phone calls based on different data, such as phone number, call result, date, phone extension and much more. Download customized CDRs to Excel. Check out call queue statistics to improve the service. 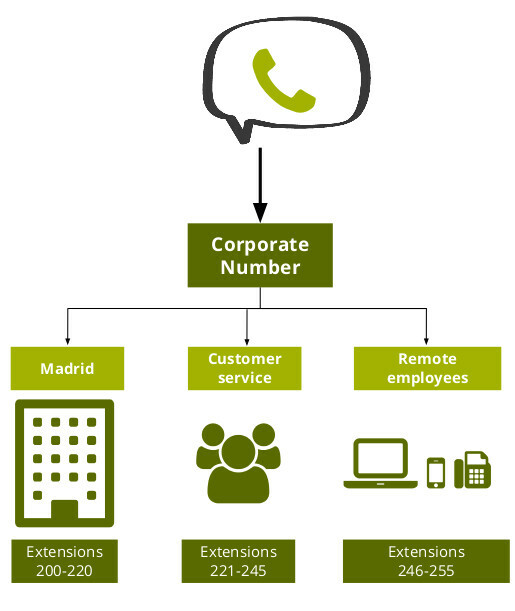 Transfer phone calls to phone extensions located on your office or remote locations. Transfer phone calls to mobile and fixed phone numbers from other providers. Direct and 2 step call transfer. Smart call forwarding allows phone extensions to forward phone calls based on the status of the extension (busy, not registered...), the result of the phone call (no answer), time and much more. For enterprises where users share their desks due to shifts. Allows them to use their own phone extension on the VoIP phone. Perfect for call centers and contact centers. Make sure you are not going to lose phone calls in case something happens on your internet connection or electricity. Use your virtual fax from anywhere with email access. Sending faxes is as easy as sending emails. You will send faxes from your email address. You will receive faxes on your email. Record phone calls on demand or record every phone call. Phone calls are saved on the cloud and accessible from your online panel. Save money when calling internationally with your smartphone. International phone calls with Telsome rates from your smartphone. Show your enterprise phone number instead of you mobile phone number. Gain new customers around the world using phone numbers from the countries where you want to grow. Customers will call you at local rates, breaking the high cost impediment for customers to call you, and sell more. Our hosted PBX can forward the phone call to the right user based on which number they've called. When a user will be attending phone calls from different international phone numbers we can preceed the phone number with 3 letters to let him know in which language to answer. Save time and have meeting easier thanks to the conference room. Set up a meeting at a specified date and time and meet colleagues from other locations over the phone. Users invited to the meeting will be able to join the meeting.